In the hunt for new ways of creating renewable and clean energy, few technologies have generated as much excitement as the tiny, flexible solar cells developed by USF physicist Xiaomei Jiang in recent years. Now the cutting-edge cells are about to make their debut in a way that could transform how solar energy is generated: in see-thru glass windows capable of generating electricity as light--both natural and artificial--passes through the panels. 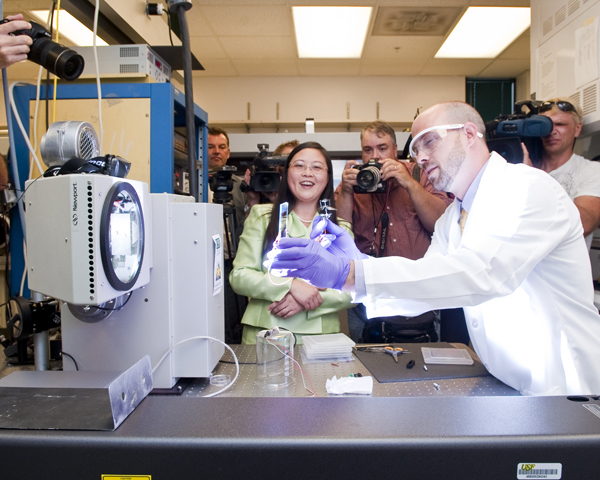 Jiang's invention was unveiled on campus Thursday in a public demonstration of the new SolarWindow™ technology, the first-of-its-kind, small-scale prototype capable of generating electricity. Electricity generated by New Energy’s SolarWindow™ on prototypes of see-thru glass windows was showcased in USF’s Science Center (SCA), in an event hosted by New Energy Technologies. “The public demonstration of our novel SolarWindow™ technology is a very exciting milestone for all our stakeholders, including the research team, management, and shareholders of New Energy,” said John A. Conklin, president and CEO of New Energy Technologies, Inc., a Maryland-based company. Electrical power is generated on see-thru glass through solar cell coatings which are sprayed onto surfaces. This patent-pending process enables researchers to spray SolarWindow™ coatings onto glass at room temperature, eliminating expensive and often cumbersome high-temperature or high-vacuum production methods commonly used by current solar manufacturers.